by Yumiko Sato / Huffington Post / March 5, 2014 / As the third year anniversary of The Great Tohoku Earthquake approaches on March 11, what does Fukushima mean to us, Japanese? The answer depends on who you ask: For many, it is a constant reminder of the nuclear power plant accident, the reason to protest against the danger of nuclear power, a place where their donations and prayers are sent. For some, it is a faraway place they rarely heard of until the recent tragedy, an obscure northeastern prefecture known for peaches, kokeshi dolls, and onsen (hot springs). For me, Fukushima is my ancestral home. 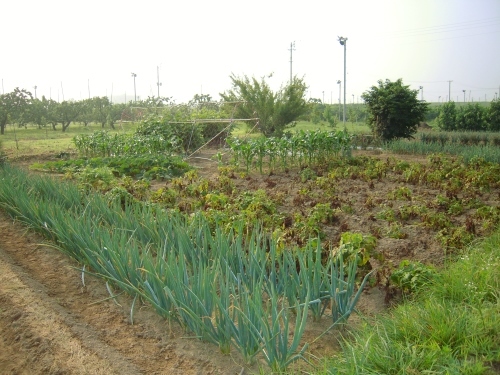 My grandfather was a farmer who grew fruit and vegetables on his small farm near Fukushima city. Until he died recently at the age of 96, he sent us fresh produce from his farm throughout the year. My grandmother owned a small market, so she, too, regularly sent us boxes of various local fruits and vegetables – peaches, cherries, grapes, cucumbers, pumpkins, spinach, etc. Produce from Fukushima meant fresh, tasty, and nutritious. Today they raise concerns about radiation. During the summer break or New Year, I visited my family. Taking the shinkansen (bullet trains) from Tokyo, it took only an hour and a half to Fukushima, yet they were worlds apart. Walking around the neighborhood near my grandparents’ homes, I always saw the same people, some of who were related to me in ways that I could never recall. They walked slowly and took time to smile and bow. The mountains surrounding the prefecture stood firmly in the background. I had an illusion that Fukushima was a place where I could always go back and expect more of the same. But everything changes. So did Fukushima. My grandfather’s farm in FukushimaThe change came suddenly in the most unexpected way. We had always been told that the nuclear power plant was safe. Even after the tsunami hit the plant in the early afternoon of March 11, 2011, the government and the media gave an impression that everything was under control, and that the amount of radiation emitted into the air was an acceptable level. But we now know that the damage was far worse than anyone had expected and the consequences of the accident remain unknown. People have asked why my family hasn’t moved out of Fukushima. The answer isn’t as complicated as you may think: It is difficult to relocate, leaving everything – your job, your elderly parents, your farm, your livestock, your friends, or your house with a mortgage. Even if they want to move, they can’t afford to do so. Some people are deeply connected to their land. Home is not merely a location of their residence but the center of their existence. The people of Fukushima are like that, which adds to their suffering. 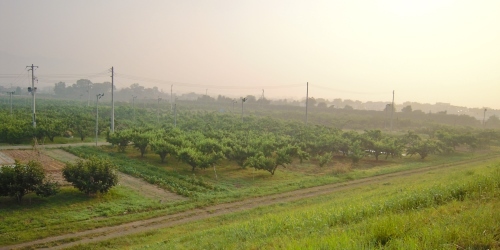 Peach farm in FukushimaThe word, fukkou (recovery) has been used frequently since the disaster. It is what everyone wants – normalcy, stability, and comfort. But I wonder how fukkou could ever happen when the contaminated water is still being released into the ocean three years after the disaster. The situation is not under control. On the way from Tokyo to Aomori, where I now live, the shinkansen passes by Fukushima. It does not stop there. But I can’t help noticing the familiar view of Fukushima city from the window and think of my family and millions of other people who are living in constant fear of radiation. Fukushima as I know it is forever changed. About the Author: Yumiko Sato is a Board certified music therapist and Writer of the Discover Japan blog. Thank you for this heart touching article. To me Japan is very special and beautifle country, quite like no other. The people are honest, highly intelligent and have made a huge positive impact on other cultures with their hard work and dedication like Sony, Nakamichi, Nichicon, Honda, Kawasaki, Nissan, Sharp, Nintendo, Sega and many others. It is very sad that such tragedy happened and I wish all of Japan strength, courage and steady fukkou. Thank you all for your kind words and for keeping the people of Fukushima in your thoughts. We truly appreciate all the love and support we have received from all over the world for the last 3 years. It has been a humbling experience.